連接您使用 Slack 的所有工具，並避免所有應用程序之間的不斷切換。設置您的集成，以便您可以直接在 Slack 中獲取所有通知（從支持請求，代碼簽入和錯誤日誌到銷售線索），所有這些通知都可以在一個中央檔案庫中搜索. Slack 中的所有內容，消息，通知，文件，所有＆mdash; 會自動編入索引並存檔，以便隨時隨地獲得。 Slack for Windows 也索引每個文件的內容，所以你可以搜索 PDF 文件，Word 文檔，谷歌文檔，等等。通過一個搜索框和一組強大的搜索運算符，您可以在通信中切分和切換一條消息。haystack. 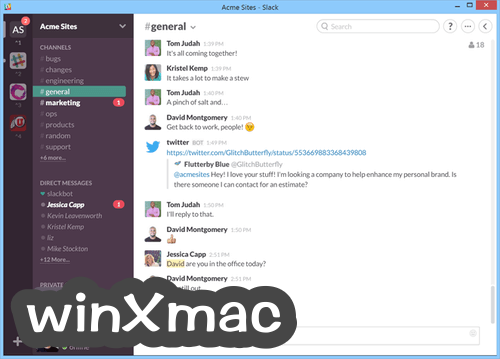 - On some Windows 7 systems, Slack kept Windows from shutting down without making a fuss. It’ll now let your system shut down in peace. 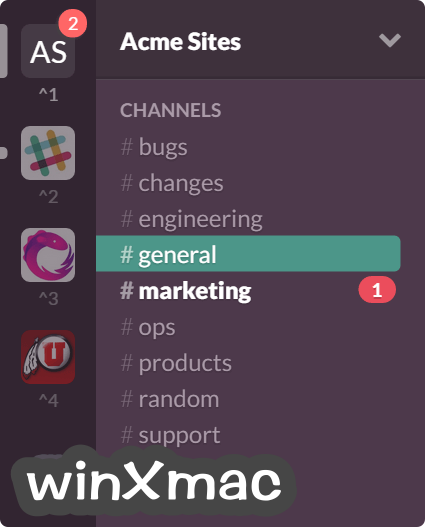 - When Windows had trouble showing your notification, Slack would panic and crash. It’ll stop doing that. - An important security update. Security updates are always important. This is one of those. 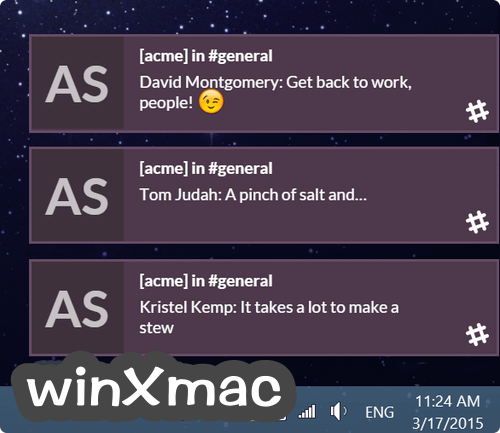 - All mentions of “team” have been changed to “workspace” when referring to the app, though not when referring to the people in it. You create a workspace. You invite people from your team. Simple! - The certificate used by Windows to confirm that Slack is truly from Slack expires on September 14, 2017. Since Slack is 100% from Slack, and it would be ridiculous to think otherwise, we got it re-certified. That's literally all that's changed. - We revamped video calls, making the experience more intuitive, and more attractive. As a bonus, they're more resource efficient and now let you change audio devices during a call. If that's the kind of thing you need to do. - Remove thine shackles from thine eyes, and behold: gloriously legible text, regardless of your display scaling! - We'll no longer clear notifications from the Action Center automatically, but if you're on the Windows Creators Update we'll bundle them up so that it's easier for you to do. - A rare bug that turned Slack into a process hydra: receiving notifications or switching channels would spawn new processes seemingly without end. - The Launch on login preference should be more reliable this time around (for the technically inclined: it now uses the registry instead of a Startup shortcut). - We paved over a series of potholes that were strewn about the app, making crashes far less likely. - Should you ever wish to say goodbye to one of your teams, a right-click > Remove from the sidebar will do the trick now more reliably than before. - Switching teams using the numbered shortcuts is noticeably faster. We would say "37%" if we were forced to put a number on it. Fortunately, we aren't, and we won't. - Opening a context menu won't freeze videos or gifs playing in the app. - We dusted off the cobwebs in the app menu and composted a few menu items that weren't useful when signed into one team. - The default window size is a smidgen larger. You won't notice, because your window will keep being the same size it's always been. That's just the way it is, and we don't want it to change. - Our spellchecker would occasionally mark correctly spelled words as incorrect. It had ONE job. It now performs it. - With surgical precision, we cut out the frame border that appeared when the app window was maximized. - If you're using NTLM or basic authentication to sign into a team, you'll be relieved to find that your credentials work. Good as new! - Rather than reloading the whole app, View > Reload now reloads just your current team. We're pretty sure that's what you meant. - What is that beacon of pure white light? Oh! It's the Windows 10 Action Center, with the rubbish–err, notifications–taken out. Whenever you switch channels, we'll dismiss notifications in that channel from the Action Center. - Use Help > Report Issue to send feedback or file a bug. It attaches your log files automatically, because who has the time for attachments? - So, you want to memorize every hotkey? Of course. Consult our ever-expanding cheatsheet, now available from Help > Keyboard Shortcuts. - Blank white apps as a result of network troubles should be a rare circumstance. It was rare before, but now it's like, extinct. Or endangered. One of those. - Launching the app from the Windows command prompt should work more reliably. Before it was, well... we don't want to talk about it.